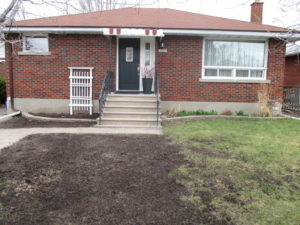 Lovely 3 bed, 2 full bath all brick bungalow in an incredibly desirable part of Ottawa! NEW in 2018: freshly painted throughout, kitchen (counter tops/light fixture), main bath redo and refinished hardwood floors. The Living Room is really big and under the awesome carpet that was laid in recent years is the same hardwood found throughout the main level. There is a stunning full, modern bathroom in the lower level done in 2017. The lower level is massive, has tasteful decor, tons of storage, a cold storage room and could easily be turned into a rental unit, if so desired. The office in this level would may need slightly different windows to be called a bedroom. The lot is a really good size, has lovely landscaping, a big shed and an oversized laneway. All this plus mere steps to Bank and Walkley (shopping, transit, restaurants and so much more) make it a definite must see!